Definition at line 236 of file AsmFunctionIndex.h. Adds a footnote to the table. Footnotes are printed at the end of the table by the ShowFootnotes callback class. Footnotes are numbered starting at one rather than zero, and this function returns the footnote number. Calling this function with an empty text argument will reserve a footnote number but will not print the footnote in the final output. The first line of the footnote is prefixed by the string "Footnote *N: " and subsequent lines are indented by the length of the prefix. Change the text associated with a footnote. The footnote must already exist, and the footnote idx is the value returned by a previous call to add_footnote(). Setting text to the empty string causes the footnote to not appear in the final output, but other footnotes are not renumbered to close the gap (because their references might have already been printed. See also, add_footnote(). Get the string for a footnote. The footnote must already exist and idx is a footnote number returned by a previous call to add_footnote(). Returns the number of footnotes. Footnotes are numbered starting at one. The return value includes empty footnotes that won't be printed by the final output. Definition at line 263 of file AsmFunctionIndex.h. Change the footnote title string. The title string is printed before the first footnote if there are any footnotes with a non-empty string. 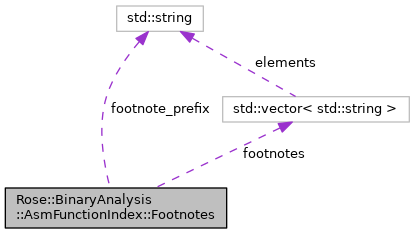 The default title is "== Footnotes ==". Set the footnote prefix string. This string is printed before every line of the footnote area. The default is the empty string. Definition at line 274 of file AsmFunctionIndex.h. Get the footnote prefix string. This string is printed before every line of the footnote area. Definition at line 277 of file AsmFunctionIndex.h. Generates a footnote name from a footnote index. The default is to return the index prefixed by an asterisk. Definition at line 286 of file AsmFunctionIndex.h. Elmt zero is an optional footnote title string. Definition at line 292 of file AsmFunctionIndex.h. String to emit before every footnote line. Definition at line 293 of file AsmFunctionIndex.h. Referenced by get_footnote_prefix(), and set_footnote_prefix().